I've got a lot of exciting things in store for you this month as fall brings things back into focus. Today's post is a fun review of a game called Molkky. The game's maker, Tactic Games sent me a copy of the game to try out and review for you all (Nope I'm not paid to review it, they just saw I write about games sometimes and thought you all would like it!). 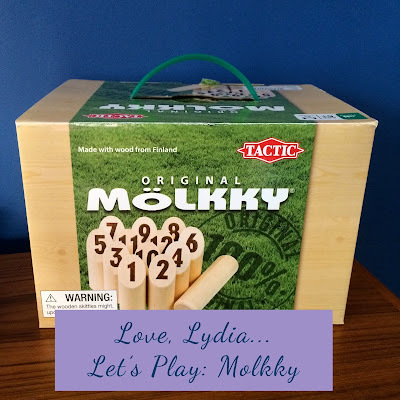 Molkky is a game that originates in Finland and is one of the most popular lawn games in Europe. You can read more about it's history here. I was hoping to try it out with family before or during Labor day weekend, but nature had other plans and sent us some rain with the remnants of hurricane Hermine. But take a peek at the video to see Bryan and I playing and enjoying this game! It gives a much better view of the game pieces in action. In terms of the quality it's nicely boxed up in a very sturdy cardboard carrying case with a comfortable plastic handle. The wooden games pieces seem to be made of a sturdy, but lightweight wood, probably pine. The whole set is built to last well, and I think families will not only get a lot of use out of it since it's a game that's easy for all ages to learn and play, but also keep coming back to it each summer. (Or if you're like us you can play indoors with bad weather!) It's not as complex as some of the board games I play, but I really like games like this that can be played at parties and family get togethers. If you'd like to get a game you can find them here through my Amazon affiliate link. And you can check out Tactic's site here as well for more information. Thanks for reading! Let me know if you have any other fun board games or lawn games you want me to try out in the comments. I'll have some more posts coming up soon. One of my best friends is married to a Finnish guy, and we played this on her first camping experience. It was so much fun! Oh I've heard of this! This looks like so much fun! I love that children of all ages can play it!